Back in June, I wrote an article “What Catholic Are Reading: Four Books for Your Summer Reading List” and in this article I said, “If I’m on my game, I’ll follow up this article with some book reviews/cliff notes and allow you all to join into the discussion on these books.” Well, I don’t know if I’m exactly “on my game,” but I am delivering to you the first of my book reviews. So, here it goes. . . So, what’s this Four Signs of a Dynamic Catholic all about? Well, its author, Matthew Kelly, is taking up quite the task—how do we renew Catholic parishes across the country? Matthew Kelly spent a significant amount of time and money focusing on what makes Catholics highly engaged at their parishes. His logic: if we figure out the difference between highly engaged Catholics and unengaged Catholics, we can figure out not only how to make more engaged Catholics, but we can also track their effectiveness in the parish. The book sold over 100,000 copies in the first month of publication and has started a conversation about how to renew the parish. Description: Specifically, Kelly notes that this consists of a daily routine of prayer. “Am I saying the other 93 percent of Catholics don’t pray? No. Their prayer tends to be spontaneous but inconsistent. The 7% have a daily commitment to prayer, a routine” (p. 8). 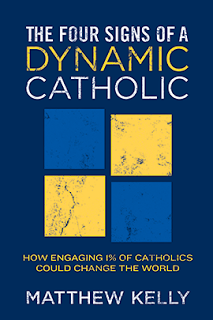 Description: “[Dynamic Catholics] see themselves as students of Jesus and his Church, and proactively make an effort to allow his teaching to form them” (p. 14). Kelly also notes that on average they spend 14 minutes each day learning about the faith. Description: Generosity covers not only time and money, but also generosity in all things. This generosity is a way of life. Why Matthew Kelly/the book is brilliant? If you have ever heard Matthew Kelly speak, it is hard to forget how compelling and inspiring one of his talks can be. Like many great motivational speakers, he writes very similarly to how he speaks. In doing so, he keeps the same tone of simplicity, logic, inspiration, fun, and well, dynamic way of speaking. This is similar to the first point, but needs to be said. Kelly is not afraid of running after a greater reality than we see today. He can paint a picture of the way the future can be and then come back into the present to show you how to make it a reality. Kelly has a monumental task in front of him – renewing Catholic parishes – but is willing to offer some of the simplest baby steps to help the reader make that next step in their walk with Christ. For example, 10% tithe may be very daunting if you currently give 2%. His challenge: Give 1% more each year until you hit 10%. Another, if you don’t have a prayer life, start by praying one minute each day. As he says, “We need solutions that are accessible to all, that inspire people to say, ‘I can do that’” (p. 17). Matthew Kelly does a great job of adding very intentional goals and objectives for parish renewal. It is easy to be caught up in all of the problems we have or in the culture we face, and often times this can be very distracting for renewal. Kelly’s game plan, whether it is perfect or not, helps us to trek towards specific goals. Each chapter has a summary at the end. This makes it easy for someone to make sure they understood all of the key points in the chapter or perhaps more importantly to go back later and review the chapters quickly. What is we could double the 7 percent? “If just 7 percent of Catholics are accomplishing more than 80 percent of what we are doing today, imagine what 14 percent could do. Not to mention what 21 percent or 35 percent could accomplish. Our potential is incredible. The Catholic Church is a sleeping giant. We literally have the power to change the world” (p. 14). Do people know how to pray? “We do an awful lot of talking about prayer, but we spend very little time actually teaching people how to pray. We assume that people know how to pray, but the truth is when most people sit down in the classroom of silence to make an earnest attempt at prayer they haven’t got the foggiest idea how to begin” (p. 47-48). “Consider this one question: What is the present culture’s vision for the human person? When you ask the question, the silence is deafening. Today’s culture doesn’t have a vision for you. It certainly does not have your best interests at heart. What, then, is the culture driven by? Consumption” (p. 81). “A few days later I discovered this quote from Fulton Sheen: ‘Never measure your generosity by what you give, but rather by what you have left’” (p. 117). “Astoundingly, when asked if anyone had ever taught them how to evangelize, 99.4 percent of respondents said no” (p. 180-181). “It is essential to the future of Catholicism that we come to the realization that the thinking that got us here will probably not transform the Church in our time into a dynamic and relevant institution. If the Church is to become vibrant again it is of vital importance that we begin thinking on a whole new level” (p. 197). Full disclosure: Matthew Kelly is a hero of mine. I love this book. Our Church needs a direction for renewal and Kelly gives us one. Is it perfect? Probably not. Could four other signs be used? Sure. (By the way this would most likely apply to any book, not just Matthew’s). 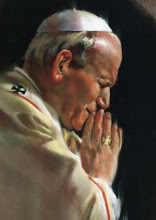 General Patton once said, “A good plan violently executed today is far and away better than a perfect plan tomorrow.” As faithful Catholics, we often settle for dreaming of a more perfect plan and spend too much time tearing one another down rather than jumping on board together and trying to make a difference. I highly recommend that you buy this book, read this book, and then try to put it in action. I’ll be trying to do so in my parish this year, which brings me to the next point.